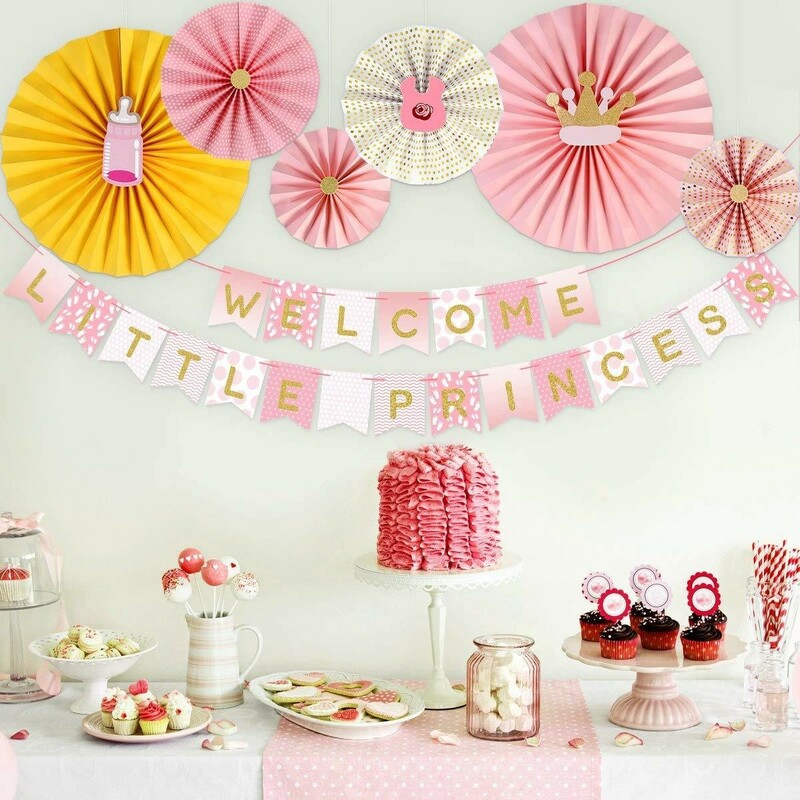 Here's a thorough guide on how to plan the ultimate baby shower. 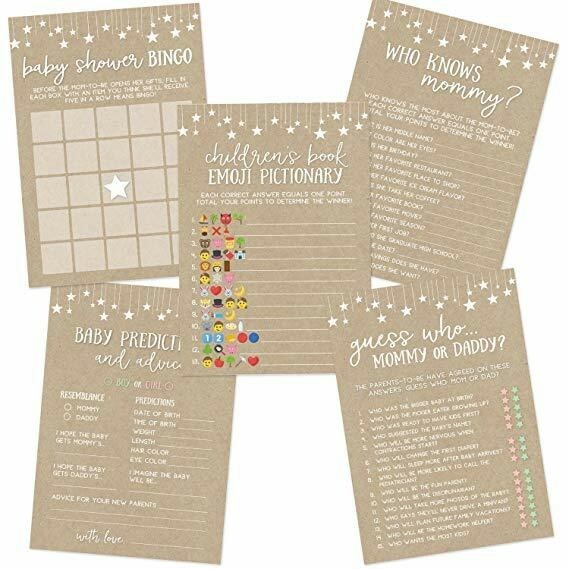 Whether you're in charge of planning a baby shower for your loved one or looking for inspiration for your own shower, one thing is certain: it can be very overwhelming if you aren't prepared, and a baby shower checklist really helps. This is even more important if it’s your first time hosting. There are so many components to planning a baby shower that must be taken into consideration — guest list, the number of people on that list, etc. — before you start choosing your theme and buying decorations and invitations. Budget plays a huge role, too. 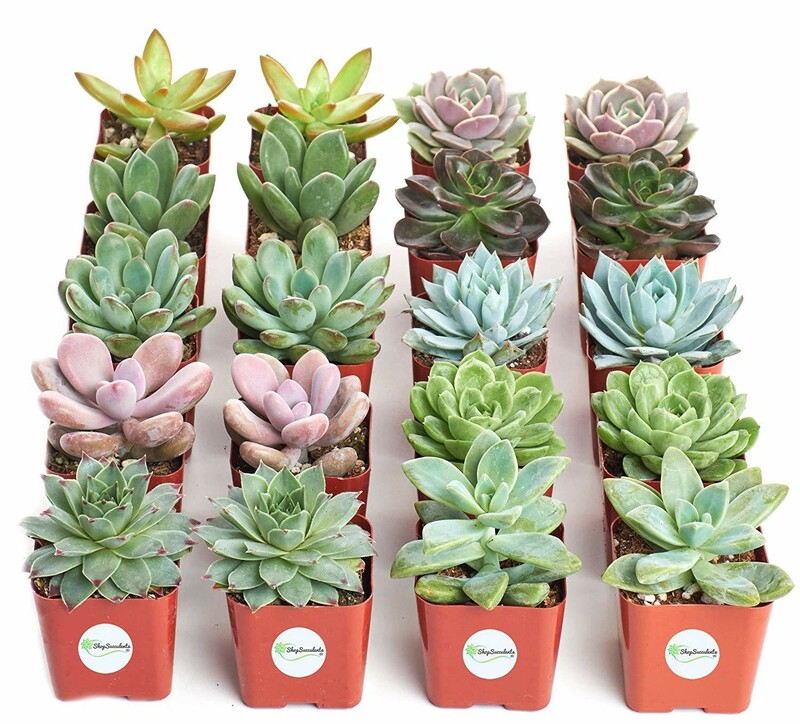 Luckily, there are so many budget-friendly decorations you can order on Amazon! Think about it: Your baby shower is the epicenter of your pregnancy (other than giving birth, that is) and it shouldn’t be overlooked. It’s a day all about mom (and maybe dad) and baby, and one of the most memorable celebrations you will host in your life. You'll also receive amazing baby products you'll obsess over. You want it to be special and make sure every detail is well thought-out. 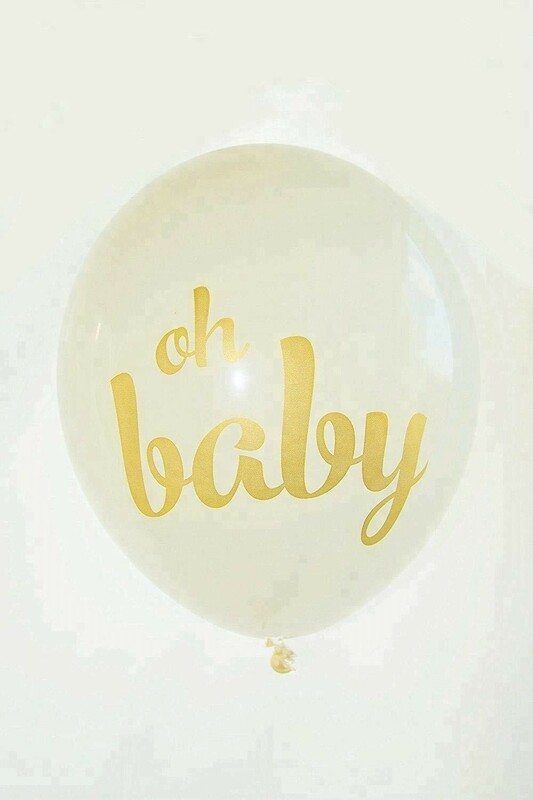 Look no further, because we’ve got all you need in our baby shower 101 guide. We're sharing all the hacks for planning the ultimate baby shower for every budget and style. We'll fill you in on what to wear, who to invite, and the most overlooked baby shower etiquette. We’ve got you covered, mama! Okay, first things first here! A baby shower is essentially a day to honor the mom to be with lots and lots of gifts and decorations for her baby on the way. It’s a day to celebrate the new life coming into the world, but also prepare the new parents with everything they will need to make their life a little bit easier as a new parent, (If only they could be gifted sleep, right?). Traditionally, the baby shower is just for the women and the dad-to-be will stop by at the end and peak in. The baby shower is all about having a fun, yet relaxed day for mom, while her friends and family make sure that she has all the essentials for everything that new motherhood will bring into her life. Baby showers are not a new tradition by any means, they were actually started by the ancient Egyptians and Greeks. However, things were a little bit opposite back then. Instead of showering mom with gifts like we do today, the pregnant women were actually hidden away for the period of time following the birth, as they believed the whole process was unclean. Celebrations would then come later, whenever the child was formally named, to celebrate the new life. These celebrations included things like festivals and visiting temples instead of receiving gifts. Are there different types of baby showers? This is one of those questions with a "yes" and "no" type of answer. A baby shower will always remain just a baby shower, but in the last handful of years, there have been other special days during a pregnancy that are similar to a baby shower, but a little bit different. First, there is the gender reveal party. This is typically a more casual, co-ed setting where the baby's parents and guests don’t know the gender of the baby but have planned a fun and surprising way to reveal it to everyone. How is this done? Mom goes and gets her regular sonogram and instead of the doctor telling her the gender of the baby, they write it down on a piece of paper to be taken somewhere like a bakery or balloon store where the people working can prepare the surprise (blue or pink cake or balloons, for instance) to be revealed later. This is traditionally done before the baby shower. Then, there is something called a sprinkle. A sprinkle is typically held if this is the second or third (or fourth!) child for the parents and they don't necessarily need all the gifts and baby gear (because they have it already), but still want to celebrate the baby. This normally consists of a smaller group of friends and family, is a little bit more casual than a baby shower, and only smaller gifts are given to the new parents. Blessingways are also increasingly popular alternatives, where the emphasis is more about honoring the mother's journey into motherhood than giving gifts. At the end of the day, it’s up to you and your partner to choose which type of celebration works best for your special day. There is really no right or wrong answer when it comes to choosing a host for your baby shower. In most cases, a close friend or family member will step forward and volunteer for the job, or the parents of the baby be might ask someone to take on the role. It’s also not uncommon for a group of people to host a baby shower together, which allows them to split all the duties involved in making the day extra special. However, you definitely want someone who is responsible to be the host for your baby shower because there really is a lot of preparation involved. Interestingly, if you are really strict about following baby shower etiquette and traditions, a close family member (like the mom's mom or mother-in-law) doesn't typically host the baby shower. This is so that it doesn’t appear that the family is out to just receiving gifts. The day should really be about being gracious and celebrating, therefore having a close friend or more distant relative like a cousin host the shower can sometimes be a more socially accepted option. Every mom-to-be has a really personal answer to this question, but the overall correct response is whoever the parents want at the shower. This typically consists of close friends and family, and possibly some work colleagues. Keep in mind that the baby shower should be a completely stress-free and enjoyable day for mom, so if there are people who you would feel more comfortable not inviting, it’s okay not to include them. In a broader sense, every culture handles baby shower invitations in a completely different way. Some cultures traditionally keep baby showers small and just for women, while others invite all family and extended family alike, with both men and women on the guest list. The choice is up to you! Should I have a co-ed baby shower? 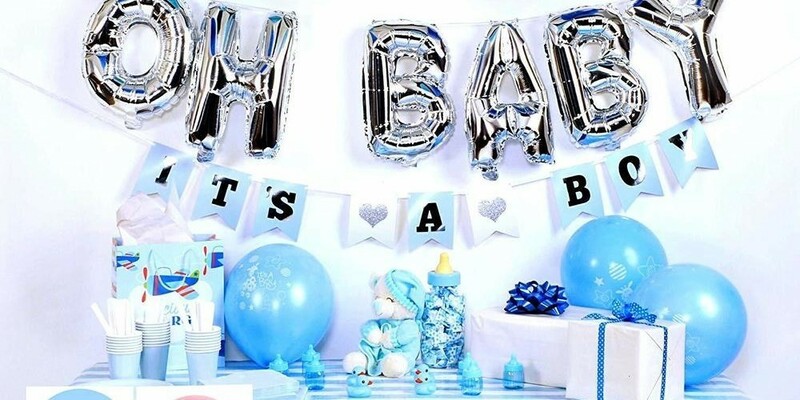 Co-ed, or both men and women attending, baby showers have grown in popularity over the past years and it honestly makes sense. Both you and your partner will be raising the baby together, so why not include everyone at the baby shower? Some of the reasons to have a co-ed shower are to include the dad-to-be because you share mutual friends, and you get to share the spotlight with your partner, who deserves to be there, too. On the other hand, a co-ed baby shower is definitely non-traditional and you might have some upset family members who don’t really understand. There’s also the fact that more people generally means more money will need to be spent on food, drinks, and baby shower favors, so your baby shower budget should be kept in mind when making this decision. And lastly, there's always that chance that a co-ed baby shower can turn into a giant bro-fest instead of the dainty, sweet shower you had in mind. It’s obviously time to have a pros and cons list! 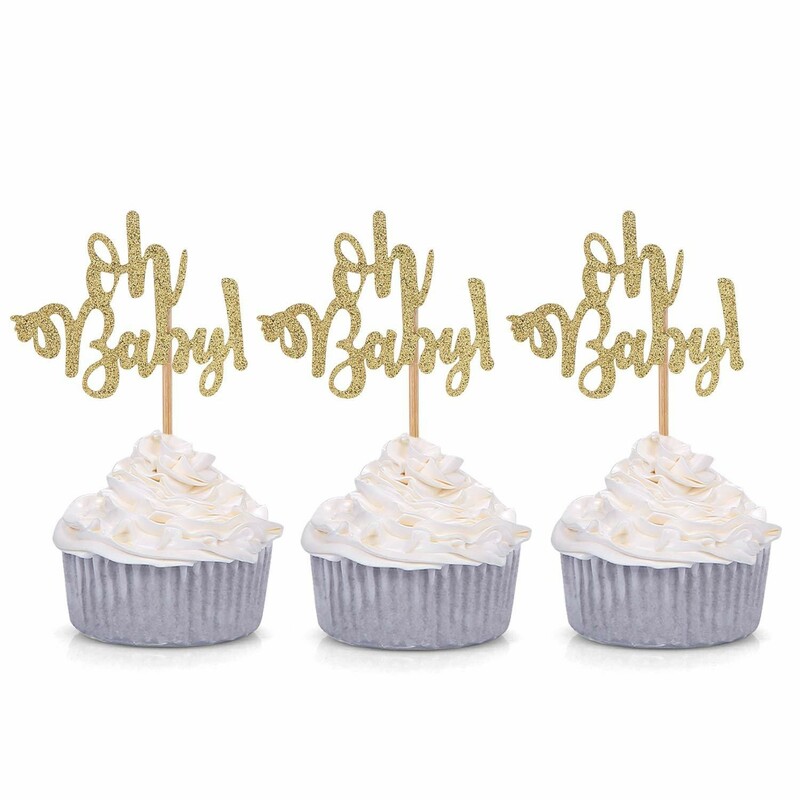 How do you narrow down a baby shower theme? 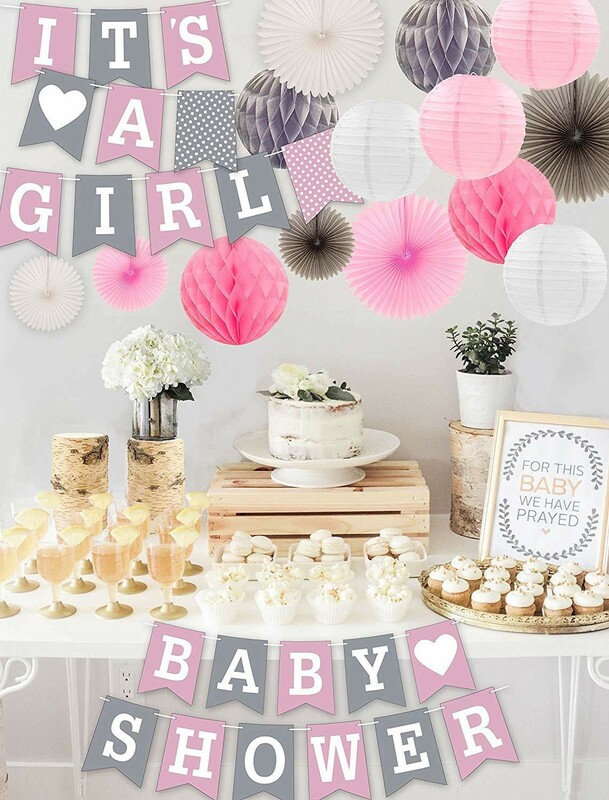 There are so many incredible baby shower themes to choose from that narrowing them down can be a tough decision! Our best advice is to first make a list of some ideas or non-negotiables that come to mind whenever you close your eyes and picture your baby shower in your head. After that, take some time to look at what’s trending for baby shower themes and see what you are drawn to. You can choose to match your baby shower theme with what you plan to do in your baby’s nursery, too, to keep things very cohesive. If you want to narrow down your baby shower theme from a more practical approach, look at things like what is actually available online when making this decision, as well as how many people you plan to include on your guest list (and also take into consideration who will actually RSVP with a “yes"). The last thing you want is to fall in love with a baby shower theme, only to find out that most of the supplies are sold out or there aren’t enough place settings available for the number of guests who will be in attendance. 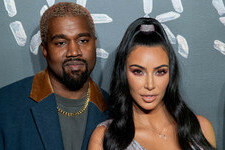 You’re also going to want to take into consideration some things like if you would rather have simplicity or a more extravagant theme, trending themes, or choosing something that is special to you and your partner and personal to you (i.e. mom's favorite book is The Velveteen Rabbit, so making that book the baby shower theme). The options are truly endless! What are appropriate food and drinks to serve at the baby shower? The real choice comes down to how the food is being served. Think about what would be easiest for your guests, such as buffet style, being served or simply opting for appetizers that are finger food to avoid having to deal with a sit-down meal. One thing to keep in mind though, is alcohol. Since mom is not drinking, it might not be appropriate to have other adult beverages at the baby shower, but check with mom first to see what her level of comfort is with this. At my baby shower, we did make a peach sangria for the guests to enjoy and I didn’t mind at all because we made mocktails, too! 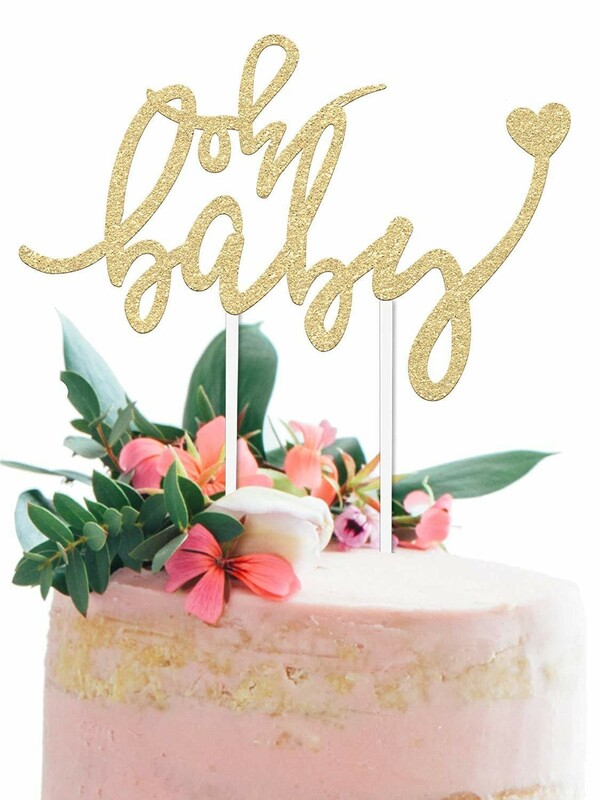 What are the trendiest baby shower decorations? 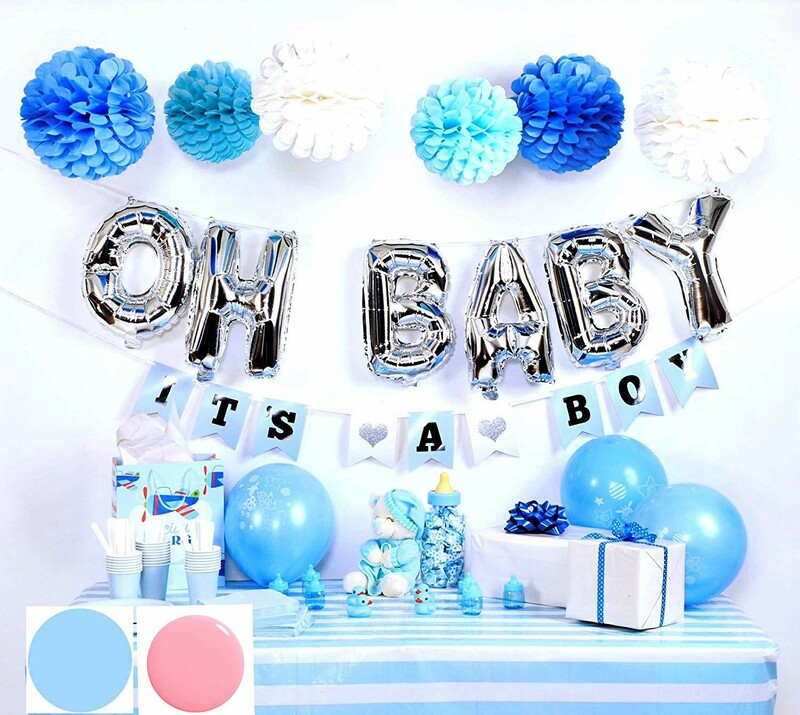 You of course want to choose baby shower decorations that compliment your theme, but there are so many trending baby shower decorations that really march to the beat of their own drum, and are simply stunning. 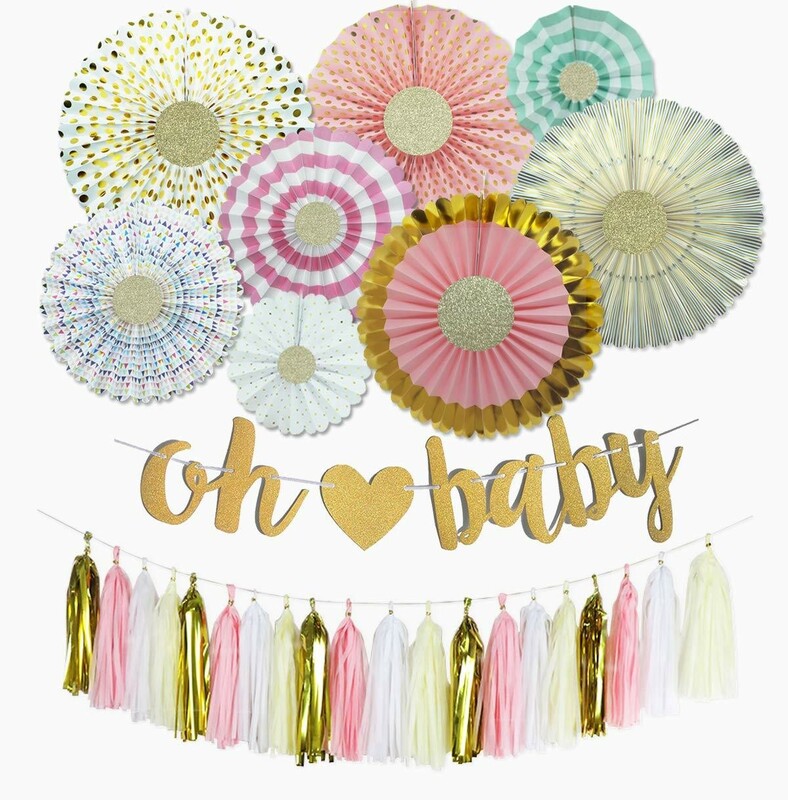 Things like table confetti, personalized banners, hanging tutus, and books are very sweet ways to make your baby shower stand out. A great way to keep things simple is with a baby shower decorating kit! However, one trending piece of the baby shower decor puzzle that is a must for all mamas-to-be are photo op supplies, selfie stations, and photo frames so that your friends and family can share your special day with everyone, instantly on social media. Want to make things extra unique? Create a special hashtag designated for your baby shower and have all guests use it whenever they post. Bonus points if it starts trending! What should I use for my centerpieces? Centerpieces for the tables at your baby shower are definitely something to think about because people pay attention and truly love to see the way decorations are being displayed. The whole point of having a centerpiece at your baby shower is to be the focal point of where everyone is seated for the shower, so you want your centerpieces to stand out. You can even DIY baby shower centerpieces! Should I hand out party favors? Yes. It’s proper to hand out party favors to everyone who attended your baby shower because they spent money on a gift for you and your family. On the flip side though, no one should actually attend a shower expecting to receive some sort of favor or gift. 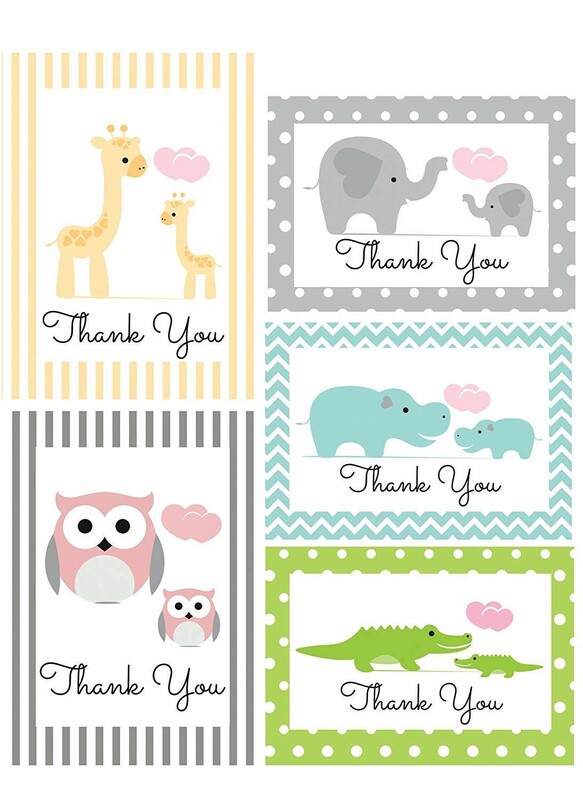 And most importantly, it really shouldn’t be something to stress over, as baby shower favors are simply small tokens of your appreciation. 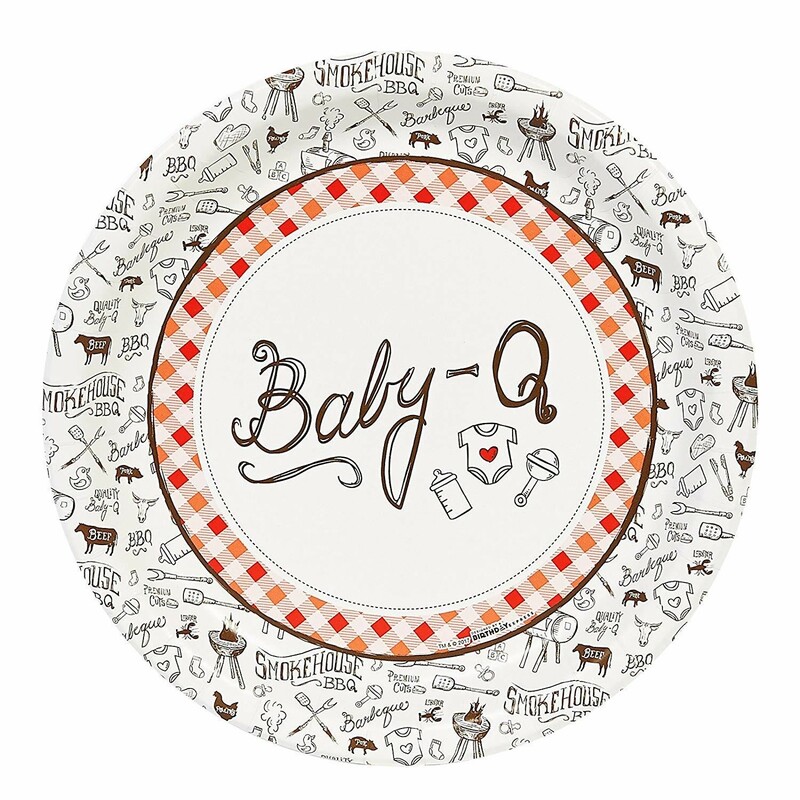 There are so many fun baby shower favor ideas to choose from, though! 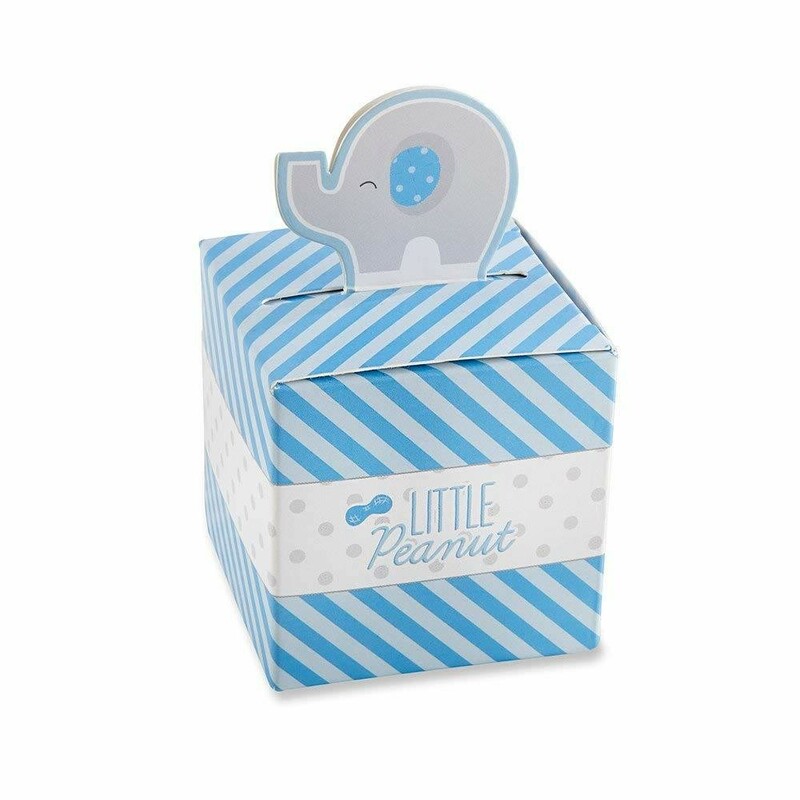 Your baby shower party favors can be something as simple as a candle, body lotion or even a specialty cookie displayed in a sweet baby shower box. You can even take the fun level up a notch and create a candy bar station at your baby shower, where guests can pour different candies into a clear bag, tie it up with ribbon and take it home with them. In addition, if you plan on playing a bunch of games at your baby shower, you could always invest a little bit more money in the winner’s prizes instead of doing baby shower favors. It’s up to you! What are some fun games to play? Simply buy a ton of white onesies and prepare a table where guests can use fabric paint and create personalized outfits for your little one. Before the baby shower starts, have someone measure mom's belly in inches and then have everyone guess. Make sure to have prizes on hand for whoever guesses the closest! There really is no other way to describe this game, but it will have your guests laughing as they play. Take fresh, clean baby diapers and melt different candy bars into them and have your guests guess which one they ate. The melted candy bars look like you know what. Start with lots of different jars of baby food, but take the labels off. Have all of your guests do some taste-testing and see who knows their baby food best! This is a really heartfelt one to include! Pick up some cards that include spaces for guests to include both wishes and parenting advice for the mom to be. It’s so sweet to read what everyone wrote after they leave! We say that if you can’t decide, why not do both? But if having that many sweets at your baby shower seems like overkill, we say to choose what makes the most sense for you. Is it easier to have cupcakes instead of having to cut a cake and hand out pieces to guests? Or, does it make more sense for you to have your favorite bakery whip up a gorgeous cake that can also double as a centerpiece because it’s so beautiful? Decisions, decisions. At the end of the day, you want to choose what works best and is probably the easiest of the two options for you and your host. Once you have decided between cake or cupcakes for your baby shower, choosing what flavors of cake, icing and a possible filling is probably an even more challenging choice. After all, mom’s hormones are raging and she might crave chocolate and peanut butter one minute and lemon with raspberry filling the next. Luckily, most bakeries will gladly offer baby shower cake testing just like they do for weddings so that mom can lock down what really tastes the best to her for her special day. And if mom chooses cake, this gold cake topper will be extra special on top! What should I wear to my baby shower? Women are forever asking themselves what to wear to events universally, but it becomes extra hard to choose what to wear to your baby shower because shopping when you’re pregnant is tough! The answer to this very important component of your baby shower is really whatever you feel the most comfortable in (it’s your special day, of course), but you also want to look nice because you’ll be in lots and lots of pictures. Overall, the best choice is to go with a dress that comes in a fabric that’s comfortable enough for you to wear all day. 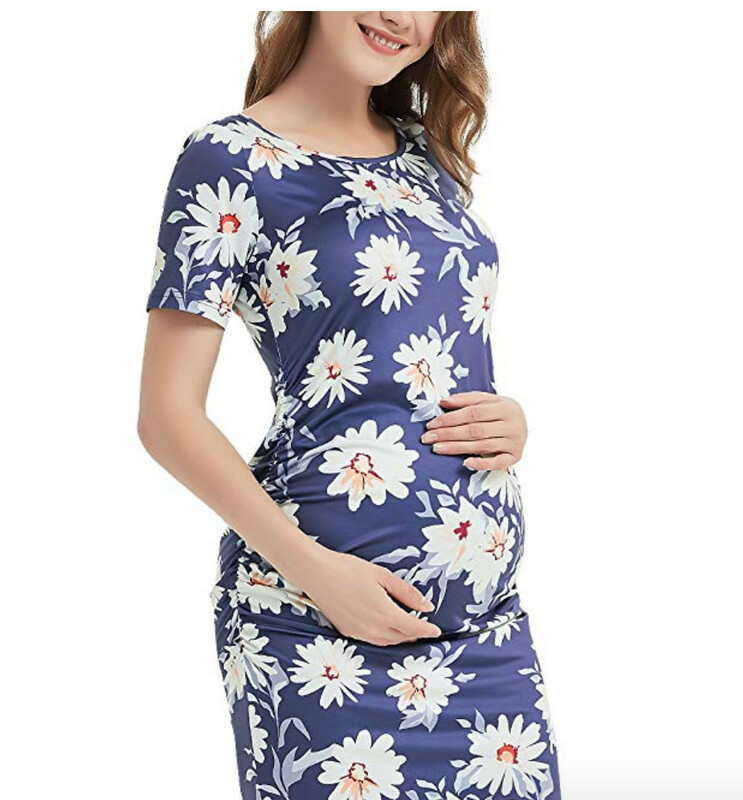 You don’t need to buy a size larger just because you are pregnant. Designers take this into consideration when creating the garments. If you are pregnant with multiples, avoid dresses and outfits with buttons! Just because you are carrying a baby doesn’t mean you have to change your style! Don’t be afraid to wear something form fitting! 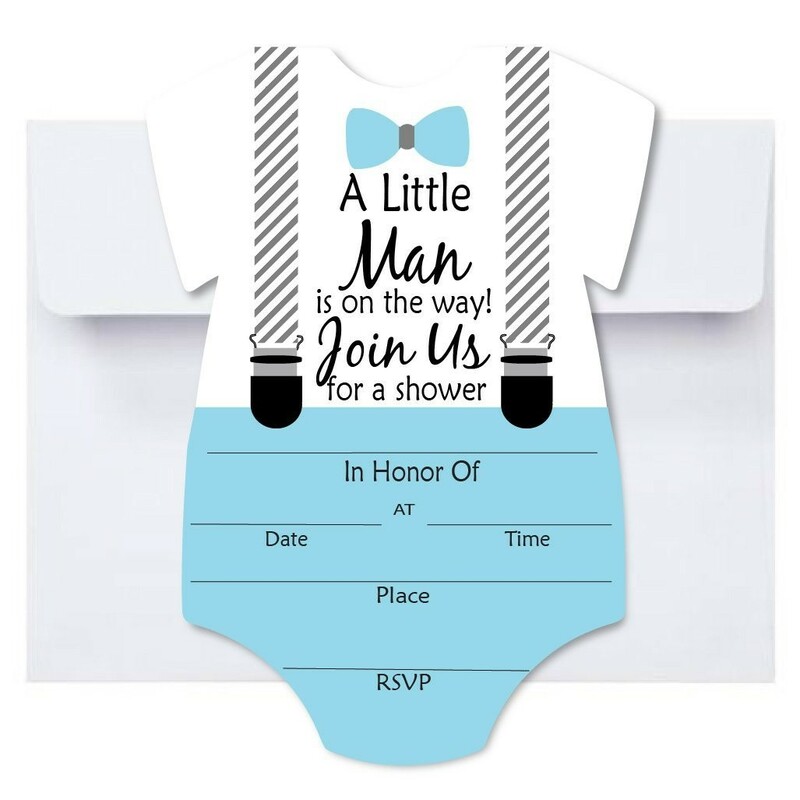 Baby shower invitations, like wedding shower invites, are still done in a pretty formal fashion by being printed or written out and mailed to your guests. If you choose to send e-vite, that’s fine, too, you just have to be extra cautious about emails bouncing back. It’s imperative that all the important information your guests need to know is found on the invitation such as date, time, location and information about where the parents are registered. Most baby showers are just for the mom-to-be and adult female guests. It’s very non-traditional to have children attend a baby shower because the focus should be on mom instead of them. However, if the mom-to-be has extended the invitation to children, that’s fine, too. But showing up with uninvited little ones is never a good idea! Mom's hormones are raging and being pregnant is one of the most emotional times in her whole life. All guests should really take into consideration what they are saying and how they are saying so they don’t upset her on her special day. This is very important for the host to keep in mind. If you are having a breakfast or brunch shower, make sure a proper meal if being served. If you have a girls night out shower, make sure appetizers or dinner is being served. We promise you don’t want hangry guests. After the shower is over, it’s very important for mom to send out heartfelt thank you notes to all of her guests, sharing how grateful she is for their sweet gifts. It’s extra helpful if a friend or the host makes a list of who gave what present when mom is opening them all so that she has an organized list in case the cards get mixed up.